The foundation myth is simple: Aboriginal art as we know it today – acrylic painting on canvas - emerged from Papunya in 1971/2. But now the question is being asked - was the less well-known Yuendumu community actually the progenitor of the contemporary Aboriginal painting movement? This fascinating theory is being floated by two researchers – Apolline Kohen and Bethune Carmichael, in the June issue of the Australian Aboriginal Studies journal. They believe that it was at this Warlpiri township, 150kms up the Tanami Track from Papunya, settled in the 60s, that the initial decision was made to give ceremonial art a permanent form. Ironically, it took the form of painting on the walls of a museum that the male elders had built; but, unlike the iconic Papunya School wall paintings that we know so much about, it's still there. 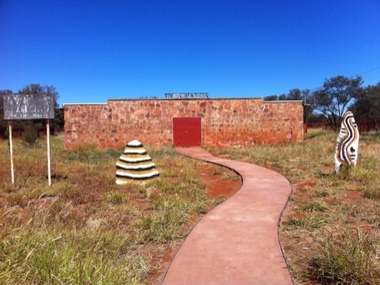 It's even possible that school-teacher Geoffrey Bardon witnessed the opening of the Yuendumu Museum on 31 July 1971; and it's certain that Paddy Japaljarri Stewart – one of the artists who tackled the Yuendumu school doors in the 1980s - was painting in both Yuendumu in the late 60s and at the Papunya school a year or so later. So perhaps Papunya wasn't the tabula rasa we've always been lead by Bardon to believe it was? 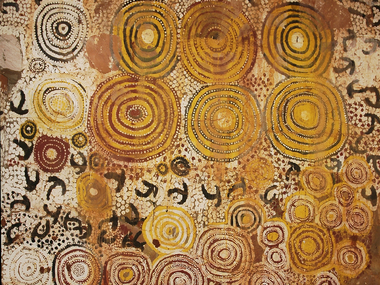 Although Papunya painting quickly mutated from a project mainly intended to impress and educate young Desert tribesmen with the existence and complexity of their culture, and, via the establishment of the Papunya Tula Artists co-operative became commercial, the purity of the Yuendumu men's intentions to bring the essence and artefacts of their religion in from Desert caves and distant sacred sites to their new, Western-planned community remained paramount for a decade. Indeed, it may be hypothesised that the failure of this project – the Museum ceased to function as a ceremonial site and a tourist attraction late in the 70s – may have lead on to the commercialisation of art in Yuendumu in the 80s. According to Paddy Japaljarri Stewart and Paddy Japaljarri Sims, it all began with a Jungarrayi sand-painting out bush, intended as a challenge to other skin groups (of which there are 8 in all in the Desert) to do something about the threat to their culture when they no longer lived on the lands they had a responsibility for. The Japaljarris and Jangalas took up the challenge – and in the end all the skin group leaders came together to build a substantial museum and fill it with their most sacred objects. The SA Museum supplied both lockable shelving for the most secret/sacred objects and glass cases for viewable items. Part of the floor area was a group sand painting like the one reproduced in the Art Gallery of NSW at a Perspecta in the 80s. But what to do with the walls? Paint them – nine works in all, two more than 15 metres long and one, more than 2 metres high. Eight skin groups and nine paintings – the article fails to explain this anomoly. But such images as I've seen suggest a much richer iconography was incorporated in the privacy of the Museum (no women or children admitted) than was possible outdoors on the Papunya school walls. The painters were Barney Japanagka Poulsen, Jimmy Jupurrula Peters, Larry Jakamarra Nelson, Rufus Jungarrayi Woods, Comadi Japanangka Martin, Pompy Japanangka Martin and Darby Jampijinpa Ross, who died only a few years ago at 100. Intriguingly, the Darby Ross retrospective of 2008 revealed that he'd done sacred drawings for an American academic back in the 60s. He had no problems visualising his jukurrpa! And in the early 1966/7 he did a stint in the SA Museum in Adelaide at the suggestion of Bob Edwards. He was the perfect man, as Kohen and Carmichael say, to interpolate between two worlds: "The building of the museum amounted, therefore to an early amalgam of new Western ways with traditional knowledge and religion". Sadly, as I've noted, the Museum – which had been opened with such a flourish of dignatories from the NT and SA - fell into disrepair in the late 70s, though in a sense it was succeeded by the Warlukurlangu Art Centre in the 80s. In that centre's early years, it was one of the most serious about attaching story to every painting that was sold. What happened to the precious tjuringa locked away, however, seems to be a mystery. But in about 2005, there was the realisation that something precious was on the brink of oblivion. A Men's Museum Committee was formed, funds were raised and resoration was commenced. In 2011, the process of detailing the iconography of the art began. And according to the Warlukurlangu Art Centre website - the Art Centre is helping to fund the project from art sales - the Museum will re-open this year. Will a revived Yuendumu Museum come to be seen as the stable that gave birth to "the last great art movement of the 20th Century" (Robert Hughes) – or will the oh-so-well documented legend of Papunya survive?